Ever since the agreement was signed in 2007 I have been complaining about it. South West One was a costly mistake. It was supposed to save the participants – Somerset County Council, Taunton Deane Council and the Police force – millions of pounds. In practice it has cost taxpayers throughout the county a great deal of money. Many of those responsible for this ill-conceived idea have been fired, moved on, or are no longer in political control. They know who they are. 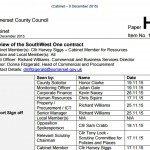 This week it is possible that Somerset County Council will decide to end the contract early. I will breathe a sigh of relief when they do.